This was originally a final project for CHEM 165, Experimental Physical Chemistry, being done with Benjamen Sun and Kenneth Brewer. Right now, Ben and I are working in the Evans Lab to try to optimize our procedure for genomic DNA. Preliminary results can be viewed here. Abstract: We present a high-throughput and generalizable FRET-based platform for identifying large genomic mutations such as deletions and insertions. The system relies on a single donor and two different acceptor fluorescent dyes conjugated to oligonucleotides arranged in a fashion such that when the deletion is present, only one acceptor probe is able to undergo FRET with the donor probe; when the deletion is absent, the other acceptor probe is adjacent to the donor probe. We develop and test this platform in the context of a favorable 32 base-pair deletion in the CCR5 gene that confers HIV immunity. 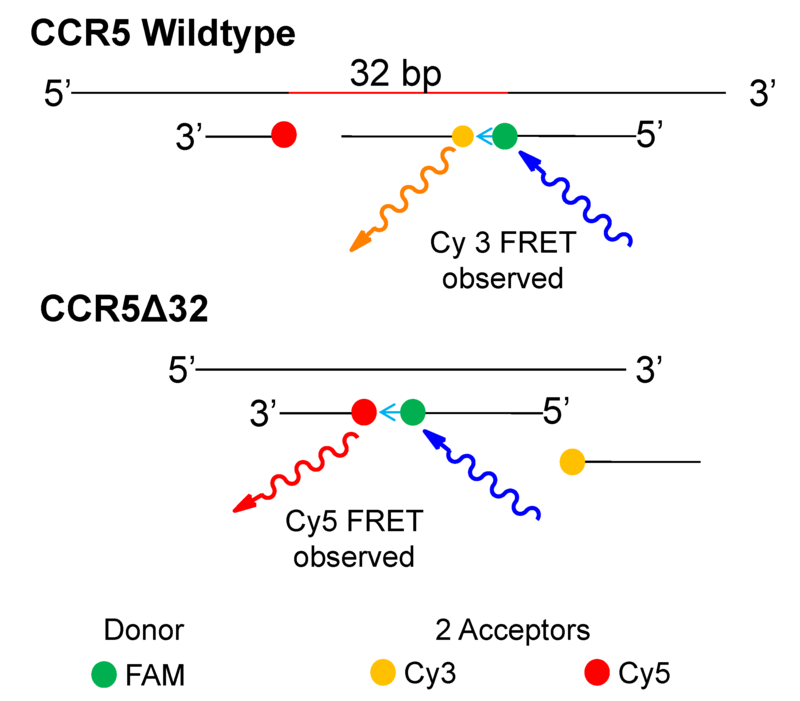 We find that our platform is able to distinguish both variants of the CCR5 gene and that signals scale linearly with relative concentration of the two alleles, allowing for the identification of heterozygotes, marking its potential as a medically relevent assay for the genotyping of not just CCR5, but most mutations where segments of DNA have been inserted or deleted from a gene. 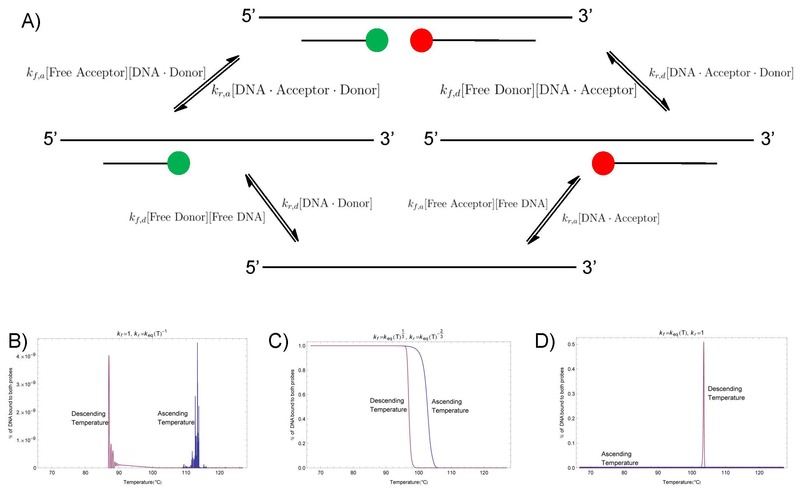 Finally, we develop and analyze a computational model for the binding of multiple probes to a single-stranded DNA, from which we infer that temperature has more of an influence on the kinetics of DNA melting (i.e. separation of two strands) rather than that of DNA hybridization. We envision that similar platforms can be used not only for the genotyping of large genomic mutations, but also studies on the kinetic and dynamic behavior of DNA hybridization.